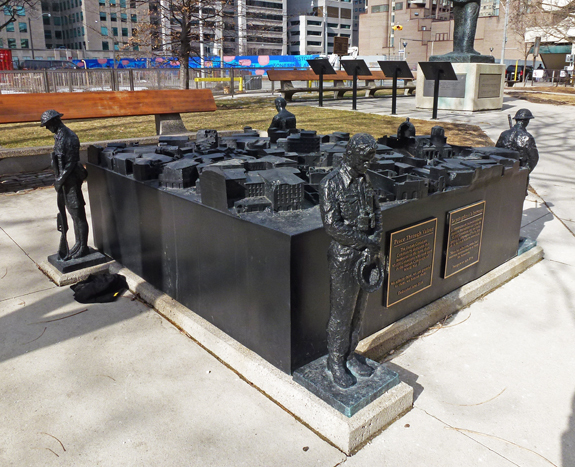 Occasional Toronto: "Peace Through Valour"
This sculpture was installed beside our city hall in 2016 and is titled "Peace Through Valour". It was commissioned by the Italian-Canadian community and is dedicated to the 93,000 Canadians who took part in the Italian campaign of WWII. The artist is Ken Lum and four members of the armed forces surround a model of the Italian town of Ortona which was the site of major fighting. Looks like we are better in honoring our victims then in preventing to get there. A living reminder of the cost and courage of war - also the reward! It must have been hard for recent immigrants to go back to their countries of origin and fight their old country men that picked the wrong side. A reminder of the sacrifices of war. A nice memorial. My grandfathers twin brother was killed in action in Italy in WWII and is buried in Salerno. This memorial is very nicely done and it's different from what we usually see. I just wish war memorials weren't needed, but that would make me a dreamer. ...count me in favor of peace. I very much agree with sc. It's an impressive sculpture though. A wonderful and meaningful sculpture. It reminds me of some of Rodin's work in Paris. A fine tribute and reminder for all. Nicely presented. Aha. I wondered why it didn't look familiar. I really need to get back to Toronto!